Face off: Was the Steam Discovery revamp a good move? Believes in being deeply personal, even when it crosses the borders of social acceptability. Doesn't want a computer choosing his games for him, unless it's a proper android like Data from Star Trek. In Face Off, PC Gamer writers go head to head over an issue affecting PC gaming. Today, Sam and Andy wonder whether last year's big Steam recommendation update was good move for the service. Samuel Roberts: YES. Valve is trying to let its customers shape their own experience of Steam. Steam has long been in need of a revamp. It doesn’t feel like it’s changed much in about five years, and with Steam Discovery—a name that admittedly makes me think of a doomed 1800s British vessel—the whole landing page is shaped to my tastes. I mean, it recommends I play Doom 3, so it can’t be entirely perfect, but still. You can even let PC Gamer show you which games to buy with the curator service. How is that a bad thing? Andy Kelly: NO. 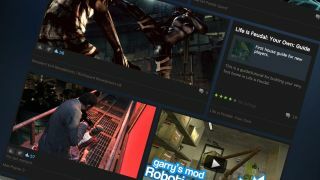 Curation won't make any difference to Steam's messy storefront. I play such a broad spectrum of games on Steam, from Euro Truck Simulator to Max Payne, that its recommendation algorithm can’t possibly have an accurate picture of my tastes. I’m looking at it now, and it’s telling me I should be playing Crypt of the NecroDancer. It’s a good game, no doubt, but it’s not for me. I hate dancing, and fun. The reason Steam’s computer brain has recommended it is because it’s detected that I’ve previously played ‘indie games’. Y’know, that vast, broad spectrum of games that encompasses every genre imaginable. Good job! SR: Well, Steam thinks I’ll like horror games and has recommended Don’t Starve and Half-Life—that seems pretty spot-on! Plus, it picked up on the fact that I like Alan Wake, and therefore pointed me in the direction of its bizarre, tiny-budget spin-off, American Nightmare. Actually, it’s recommended Crypt of the NecroDancer for me as well. That’s a weird outlier, but it’s still early days, and the attempt at understanding the user’s behaviour is surely positive. Oh... it’s recommending Five Nights At Freddy’s to the PC Gamer account now. I don’t really fancy playing that, though I know some people like it. Does Steam not like me any more? And Murdered: Soul Suspect! Stop it, Steam! AK: You see, this is the problem. A recommendation algorithm will never be 100 per cent accurate, and you might end up buying something like Murdered: Soul Suspect. Then you’ll be sad. The solution here is, in theory, Steam curator lists. Obviously, you can trust any of the games PC Gamer recommends, because we’re brilliant and never wrong, but it’s still just someone’s opinion. I’d rather have a traditional storefront with detailed search tools. I want to be able to, say, go to the RPG section, then arrange games by year, or within a certain Metacritic rating threshold. There are some sorting options on Steam, and the new tagging system, but it’s not as powerful or efficient as it could be. SR: I like that the current system allows for games of all types to get through, though—Metacritic is far from a perfect measure of what makes a great game, and even seeing some of the nonsense recommended to me adds a bit of colour. Who knows, there might be something I’ll like in there even if some critics don’t. I am the person who’s played Resident Evil 6 for over 30 hours. My criteria is very specific, and sometimes horseshit. What I’m going to do, Andy, is start my own storefront that exclusively recommends BioWare RPGs and indie games with good writing. It’s the only way I can be sure the opinions will be correct. AK: Since we started this debate, Steam has recommended me Farming Simulator. This is likely because I have 30 hours logged in Euro Truck Simulator 2. But just because I like delivering milk to Stuttgart in a heavy-goods vehicle doesn’t mean I want to harvest crops. OK, so it’s good to have games you might not otherwise play suggested to you, because variety is the spice of life and all that, but... well, I don’t really have any argument against that. Look, Steam Discovery might be a step in the right direction, but it’s different, and I hate things that are different. SR: I always thought you were cut out for a farming life more than games journalism, Andy. Not only is Steam recommending new games to you, it’s also choosing you a new path in life. I appreciate everything you bring to PCG, but what if you were to buy a ranch or drive to Grimsby instead? Valve has not only sorted out your next game purchase, it’s resolved the matter of your destiny. You just can’t handle it. AK: I mean, really, the dream is that Gabe Newell comes over to my house and gives me free, temporary access to every game on Steam. We hang out, pound beers, play a bunch of games and find the best ones. Then we become best friends and we go rollerblading and we high five each other and drink milkshakes. Man, that would be the best.